Happy Friday! Time for another WHERE YOU CREATE! 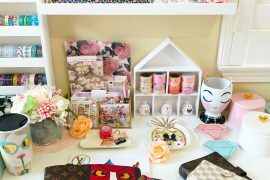 Last year we took you inside the creative spaces of our Canadian Scrapbooker Magazine team members. I’d like to share another. Desiree is one of our Guest Designers; you can find her work in the magazine and on our blog. 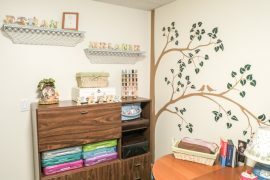 Her bio can be viewed on our home page at: http://www.canadianscrapbooker.ca/images/about/bios/desiree_saskiw.html I know I am not alone in loving Desiree’s creative style, so let’s take a peek where it all happens! I wish I could say that my scrapbook “retreat” was as neat and tidy as I often see in magazines and on-line; however, my reality is FAR from it! I am forever “pinning” ideas on how to be better organized in my office space, but the fact of the matter is, I NEVER keep it tidy! Although my office is not something I am proud of, I am happy to report that I LOVE the things that I create in here! Good for you!!! This is more real & attainable! The important thing is having creative time, not another area to keep clean 🙂 Thanks so much for sharing your space! glad to see someone being honest about their workspace. So many others show spaces that I would be afraid to work in for fear of “messing it up”. thanks Desiree!! Thank you. thank you, thank you!!! I don’t feel alone anymore. I am the same way, house tidy and organized and when I worked, very organized, but my space is my space. sometimes it looks like other neat scrapbook rooms but not that much. thanks for sharing and making me feel good about my space.